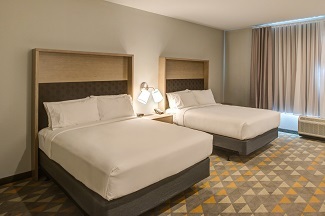 Looking for one of the newest green IHG hotel rooms in Katy, Texas with a double Queen Room that is ADA and hearing impaired compliant? How about a Katy, TX hotel with indoor Saline Pool with Pool lift, and ADA accessible game room and restaurant? The moment guests park to main entrance, public restrooms, pool lift, restaurants and bars, fitness centers, and business centers Holiday Inn & Suites Houston West Katy Mills accommodates ADA accessibility.